Decent QHD screen for the price, mine had very good colours even before calibration, some backlight bleed in the corners but I don't really notice it after a week of testing this screen. That's where tool panels usually sit anyway if you work in Photoshop or Lightroom. Unless you spend your time sitting in a dark room taking long exposure photos of a black background to compare on the internet, you should be happy with it. I tested it in few games, fastest being CS:GO, and the ghosting is really low for an IPS panel. I haven't used the freesync (got NVIDIA card) and only managed to clock it at 120Hz in QHD but I don't really care that much on my skill level to fiddle with the drivers. Would you mind a quick eloboration on the issues, as this deal is very tempting indeed. 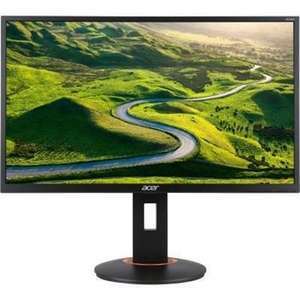 Man, 27", 1440p/144hz IPS? Just a few years ago, you'd be paying £500-600+ for those specs. Would you mind a quick eloboration on the issues, as this deal is very …Would you mind a quick eloboration on the issues, as this deal is very tempting indeed. Your experience may vary but mine arrived fine in 2 days, not sure how dealing any warranty issues might work but for the price I'm willing to take the risk. Man, 27", 1440p/144hz IPS? Just a few years ago, you'd be paying …Man, 27", 1440p/144hz IPS? Just a few years ago, you'd be paying £500-600+ for those specs. That's because the QC on this monitor is going to be non-existent. You have no idea about that. You're just making a blind assumption. Somewhat true, but there are plenty of posts on the overclock forums which suggest this. You can't expect much from a <£350 IPS 144Hz 1440p monitor. Somewhat true, but there are plenty of posts on the overclock forums which …Somewhat true, but there are plenty of posts on the overclock forums which suggest this. You can't expect much from a <£350 IPS 144Hz 1440p monitor. Well the people there aren't exactly experts. Trust me, I've posted there a fair bit and that place is overrun with people who think they know what they're talking about, but usually dont. Plus even the expensive 1440p/144hz monitors have had their share of issues. You're just making the classic fallacy that because it's cheaper, it must be bad. Well the people there aren't exactly experts. Trust me, I've posted there …Well the people there aren't exactly experts. Trust me, I've posted there a fair bit and that place is overrun with people who think they know what they're talking about, but usually dont. Plus even the expensive 1440p/144hz monitors have had their share of issues. 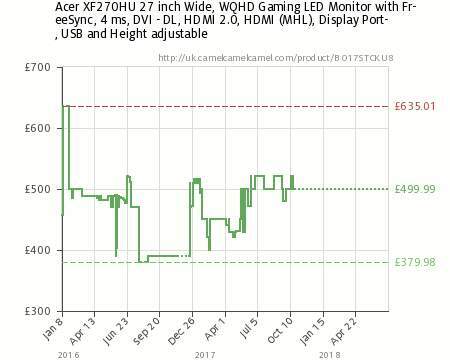 Of course not all of them are experts, but go look at the XF270HU thread and tell me you think QC is acceptable on this monitor. You're just making the classic fallacy that because it's cheaper, it must …You're just making the classic fallacy that because it's cheaper, it must be bad. Which in most cases isn't a fallacy. Does Freesync work with Geforce or Radeon? I always get that mixed up? Looking to upgrade my Dell UltraSharp U2312HM 23" Monitor with LED to something a little higher spec and to pair with my MSI GeForce GTX 1070 GAMING card. Does Freesync work with Geforce or Radeon? I always get that mixed …Does Freesync work with Geforce or Radeon? I always get that mixed up?Looking to upgrade my Dell UltraSharp U2312HM 23" Monitor with LED to something a little higher spec and to pair with my MSI GeForce GTX 1070 GAMING card. Ahh so I need a G-Sync.